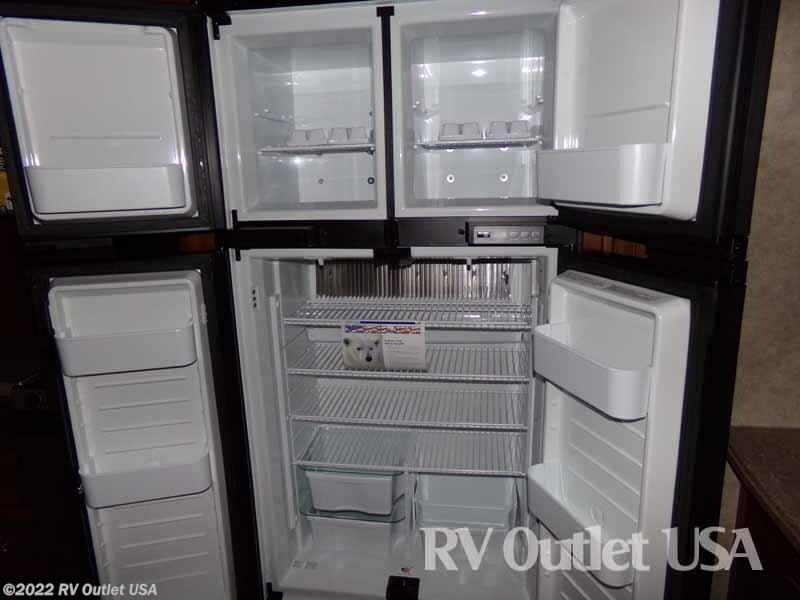 DUAL A/C SYSTEM ** 12 CU FT REFER ** MOR RYDE PIN BOX! 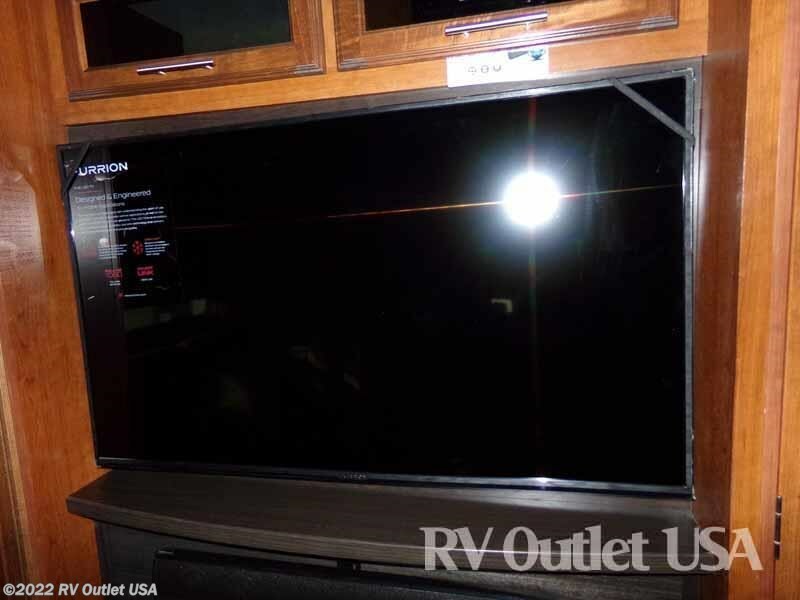 CUSTOMER VALUE PACKAGE ** 32" MASTER BEDROOM TV! 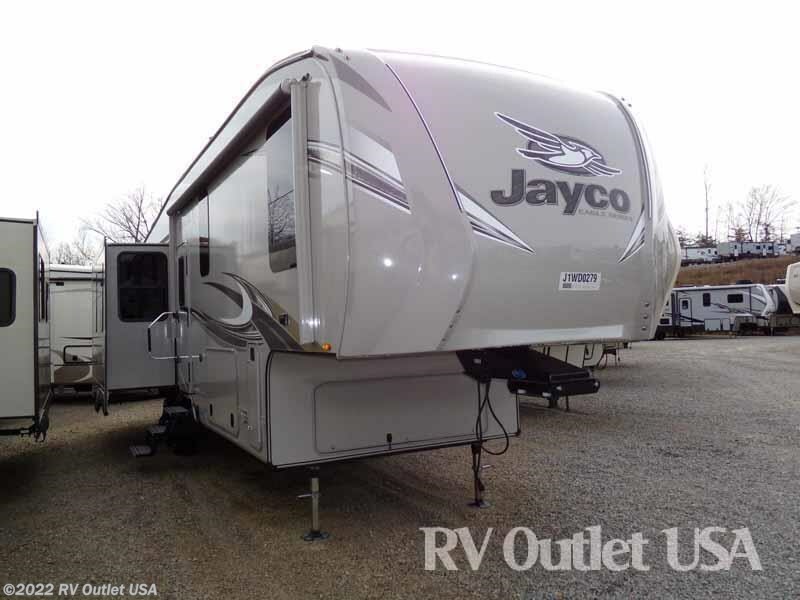 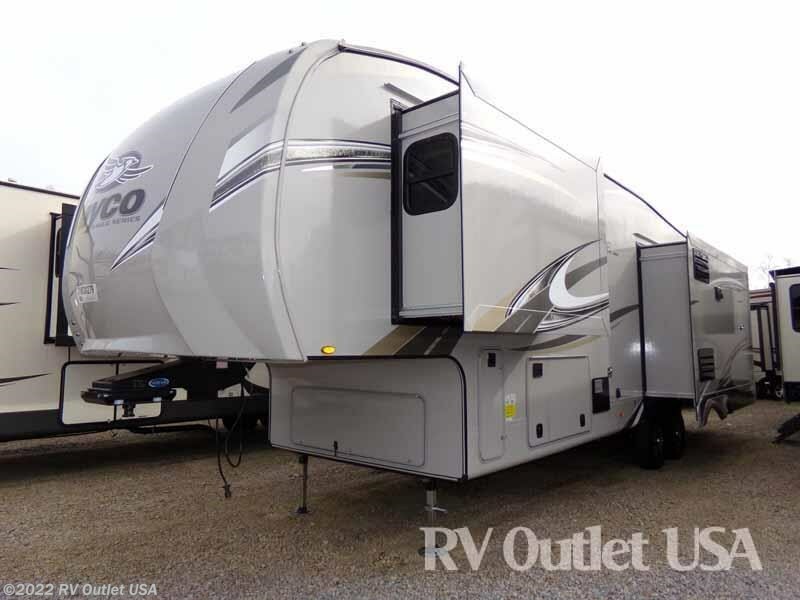 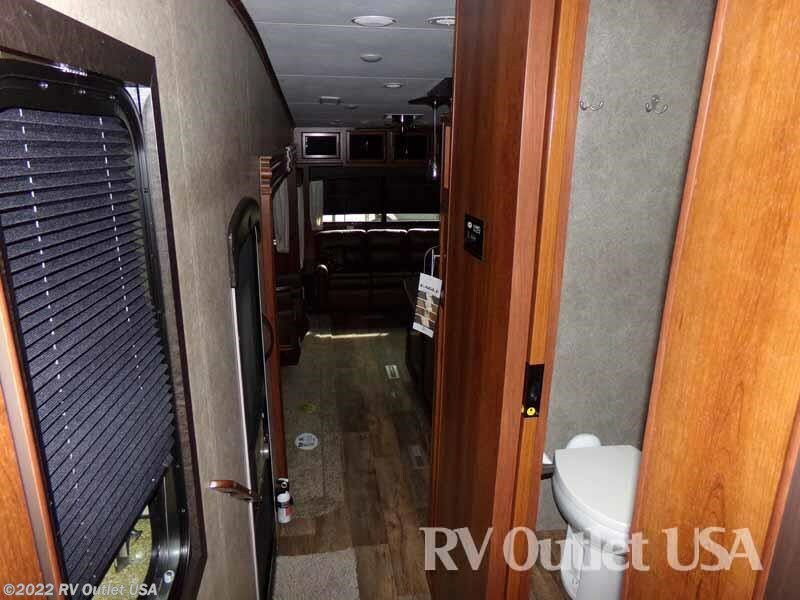 If you're in the market for a super nice, rear lounge fifth wheel with a ton of features, then you really owe it to yourself to walk through this 2018 Jayco Eagle 321RSTS that we just got in. 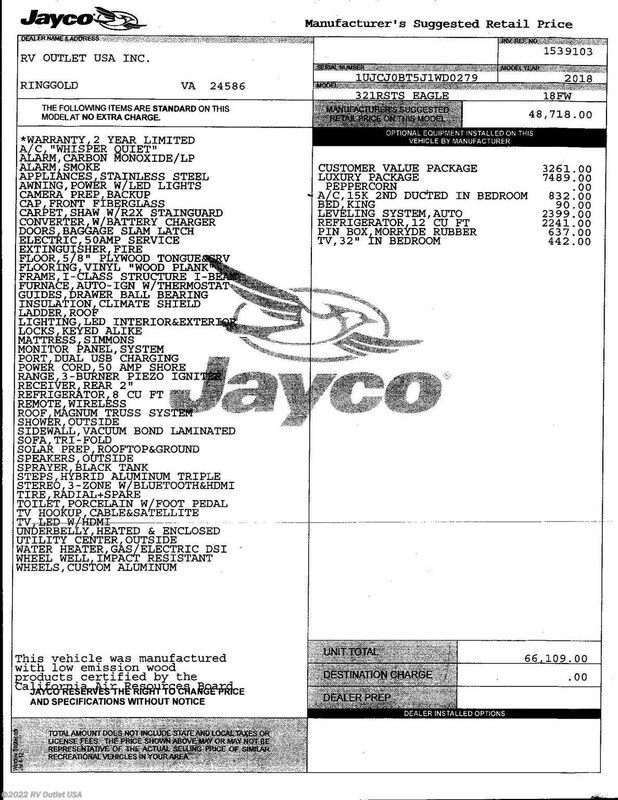 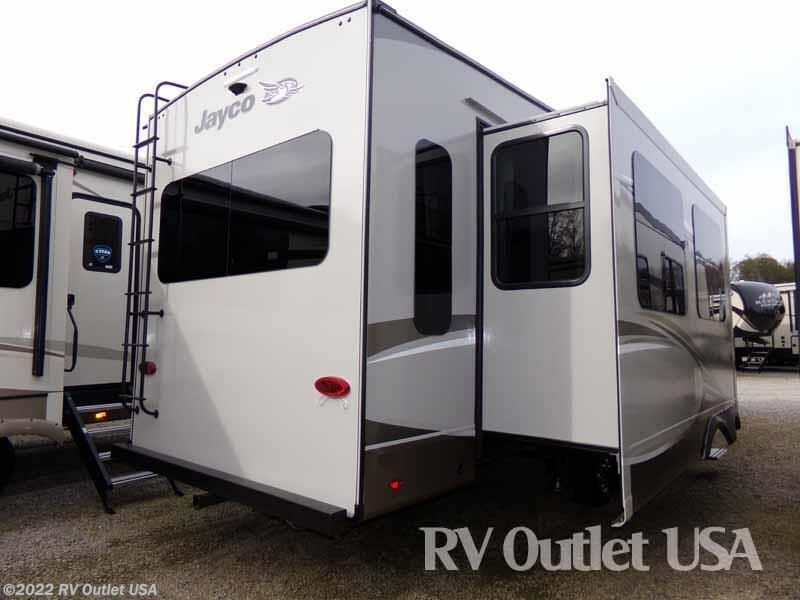 Jayco builds some of the best fifth wheels on the market today and they also have a two year warranty!! 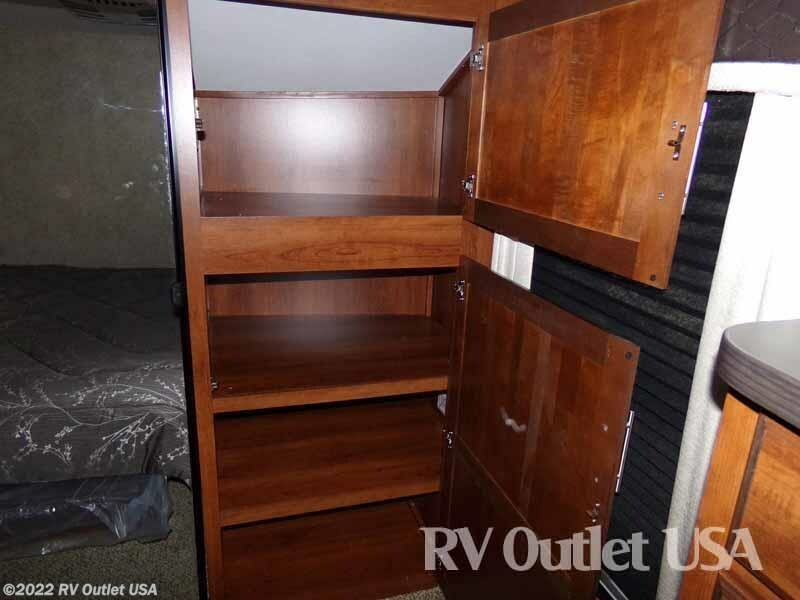 This 321RSTS has a the optional King bed slide in the master bedroom which gives you a huge walk in front closet with built-in shelves and it has another wardrobe to the side of the closet that's been prepped for washer and dryer. 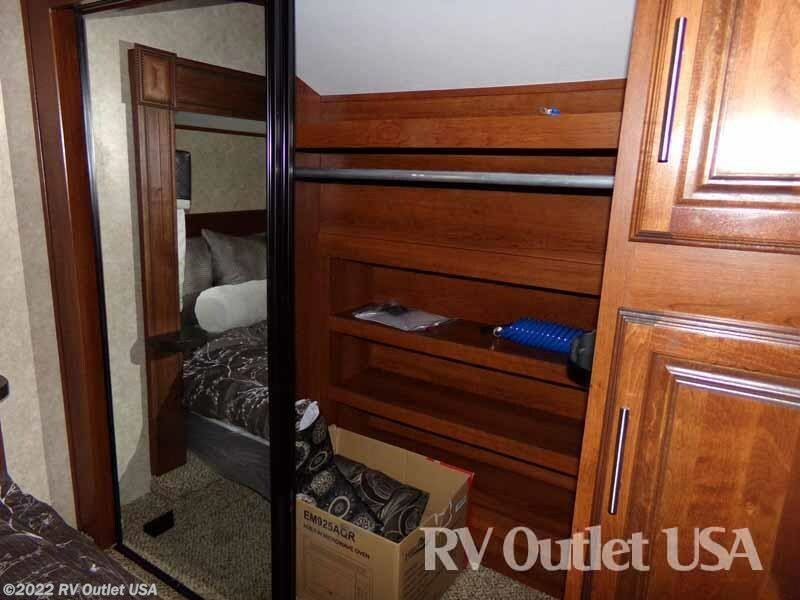 At the foot of the bed and has a dresser for clothes storage and a master bedroom TV. 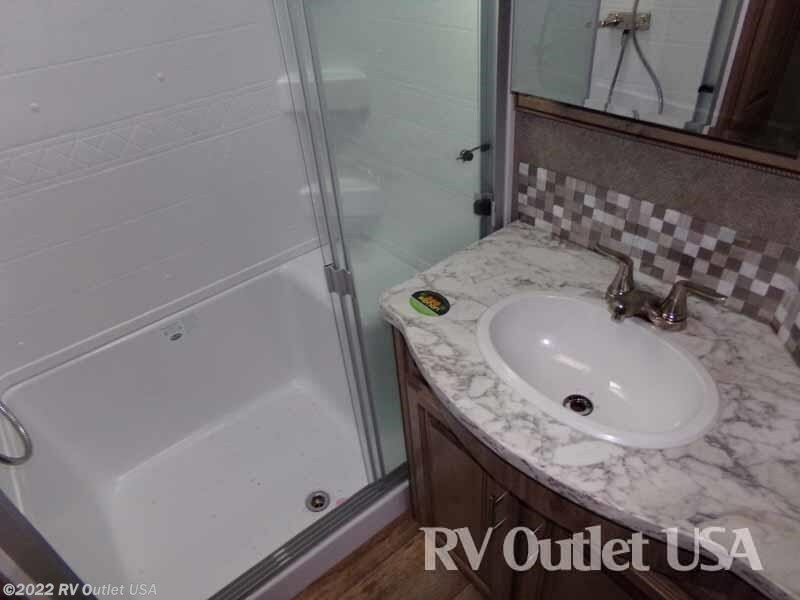 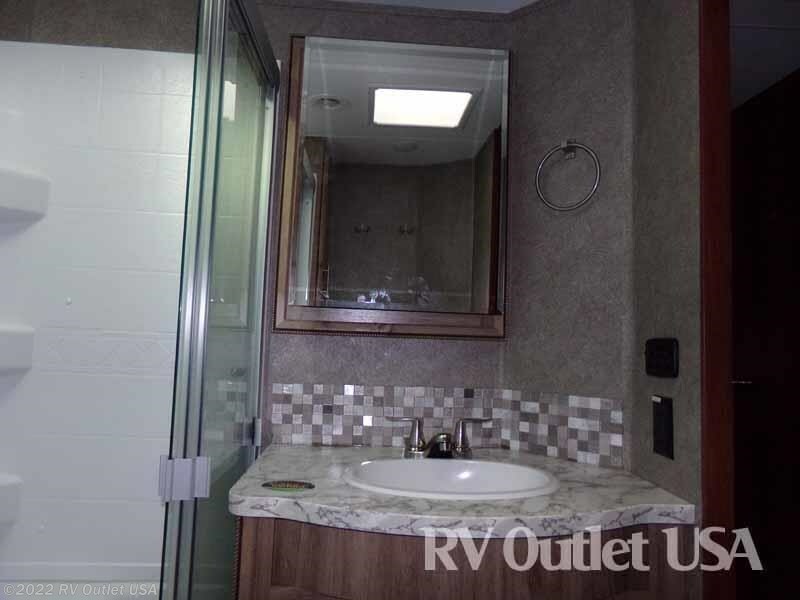 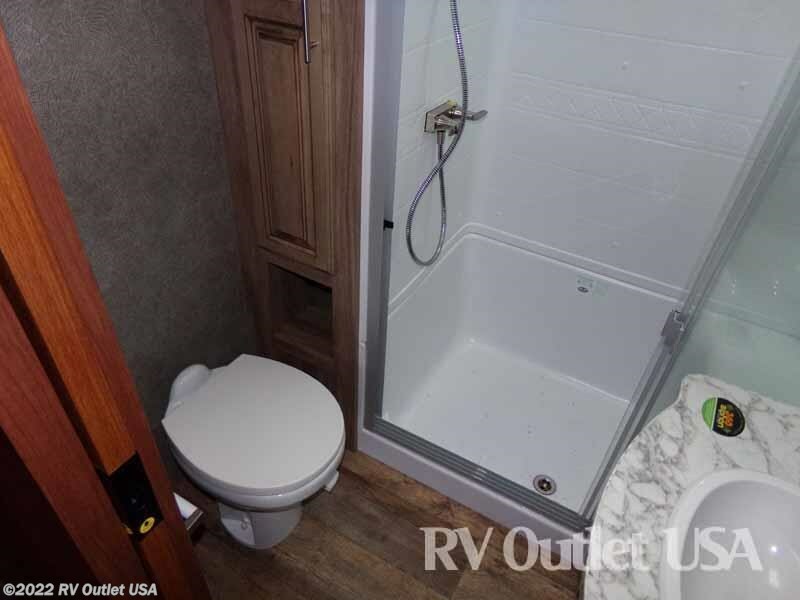 This floor plan also has a very private side aisle bathroom with a large shower with built-in seat, a linen closet, a foot flush toilet, and a sink with underneath storage and a lighted medicine cabinet all in one room. 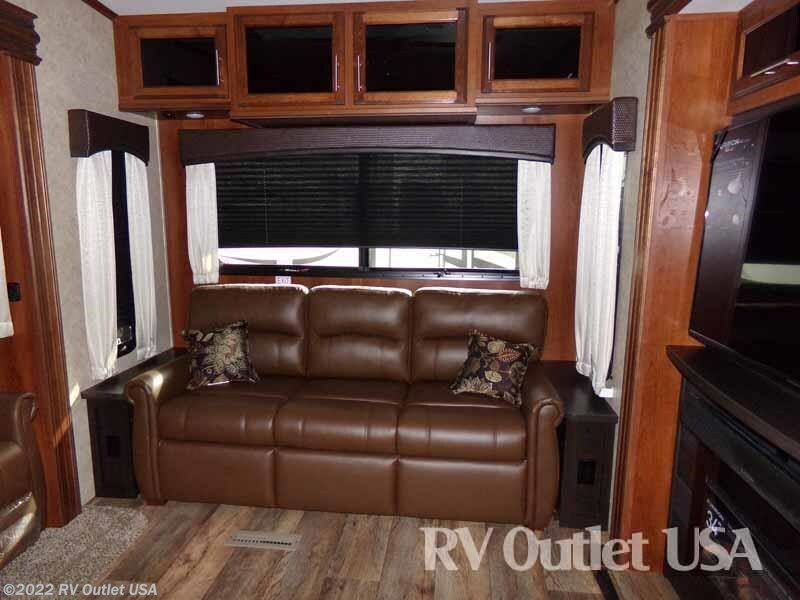 The living area is very spacious because the two large opposing slide outs. 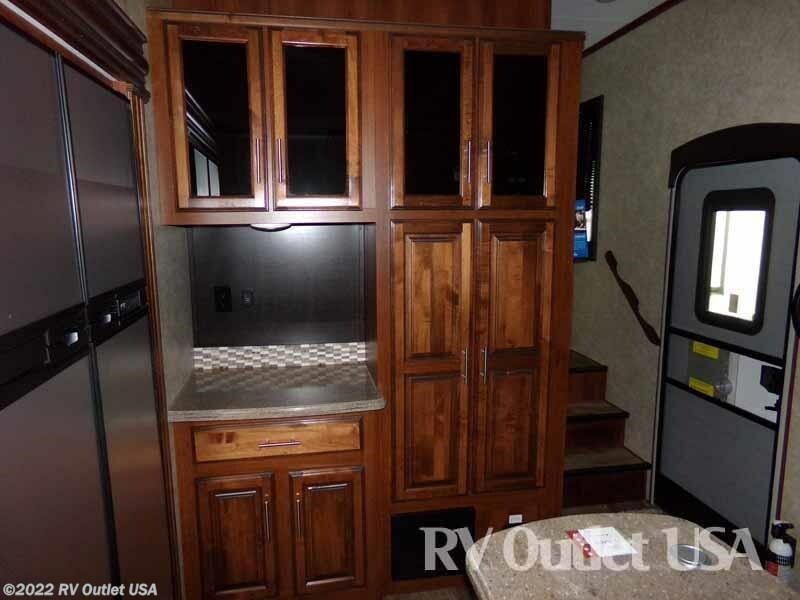 The slide on the off door side towards the front is a kitchen slide which has the ever popular 12 cu ft double door refrigerator, a large pantry, a three burner cook top with oven, and overhead microwave, and plenty cabinets for storage. 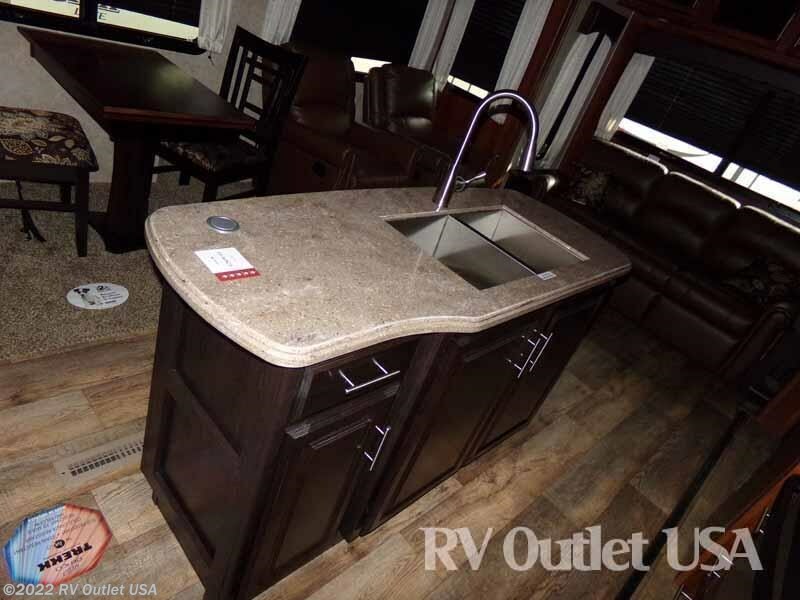 It also has an kitchen island with a double stainless sink and underneath storage. 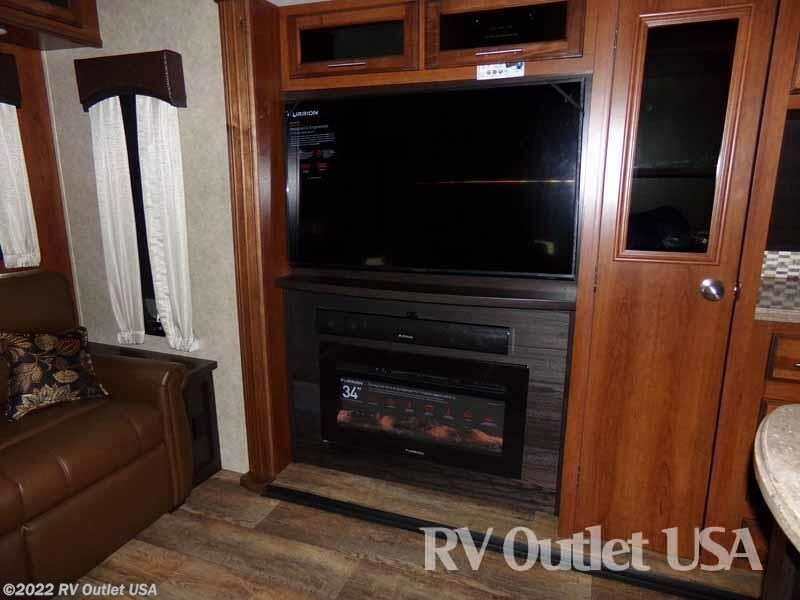 Towards the end of that slide is the entertainment center with an 48" LED TV and below that is the electric fireplace. 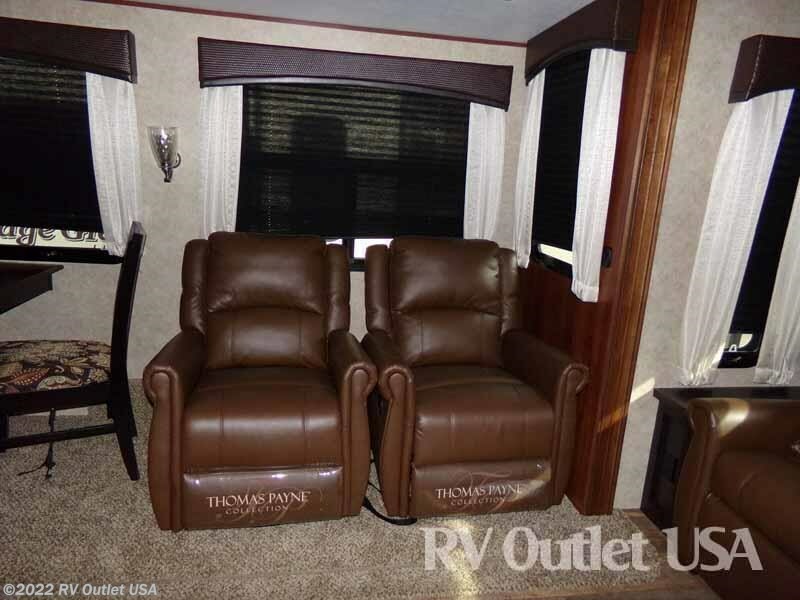 The slide on the door side has the freestanding dinette with four chairs and the super nice Thomas Payne rocker recliners which face the entertainment center perfectly. 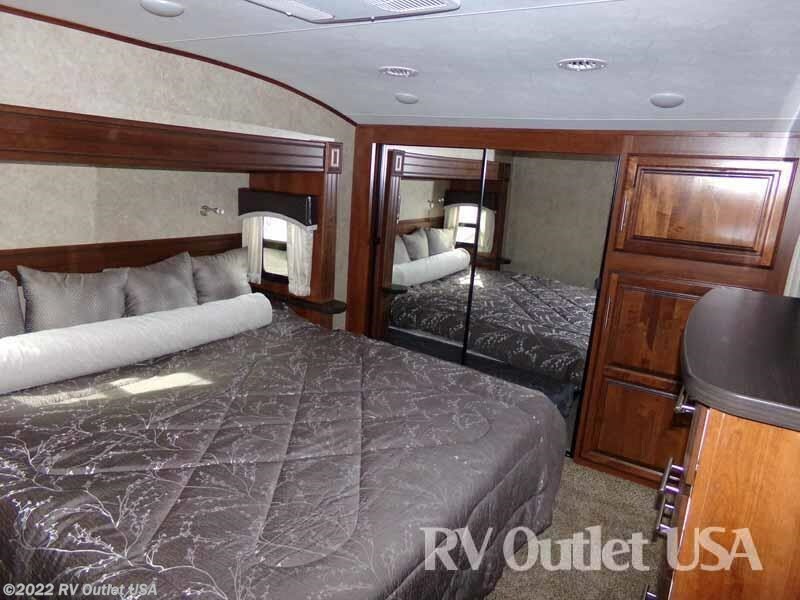 In the rear the coach is a tri fold hide-a-bed sleeper sofa which allows you to sleep up to (4) people in this coach. 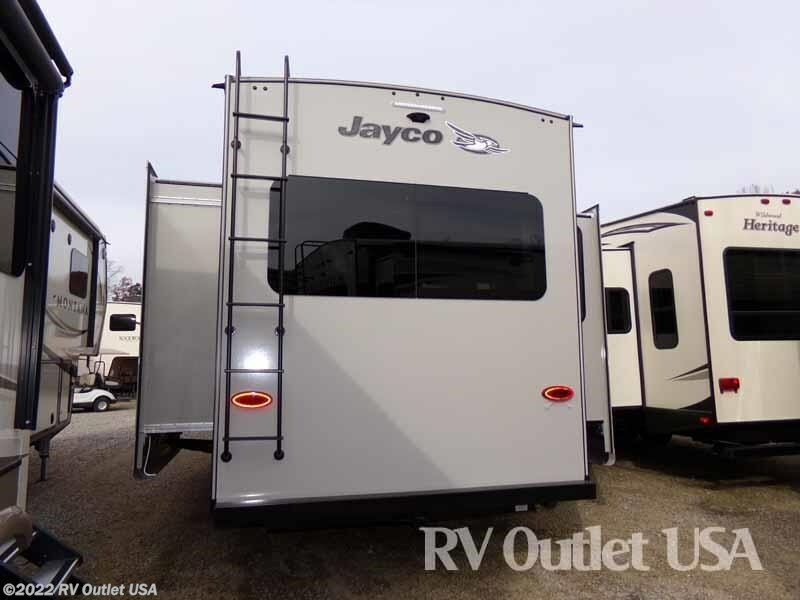 This Jayco is loaded with features such as the residential style walk in pantries with automatic LED lights, power awnings with integrated LED lights, the Mor Ryde 3000 rubberized suspension, a 48" LED TV, an AM/FM CD DVD player with Bluetooth, stainless steel microwave, solar prep, a wireless remote system, and that's just to name a few. 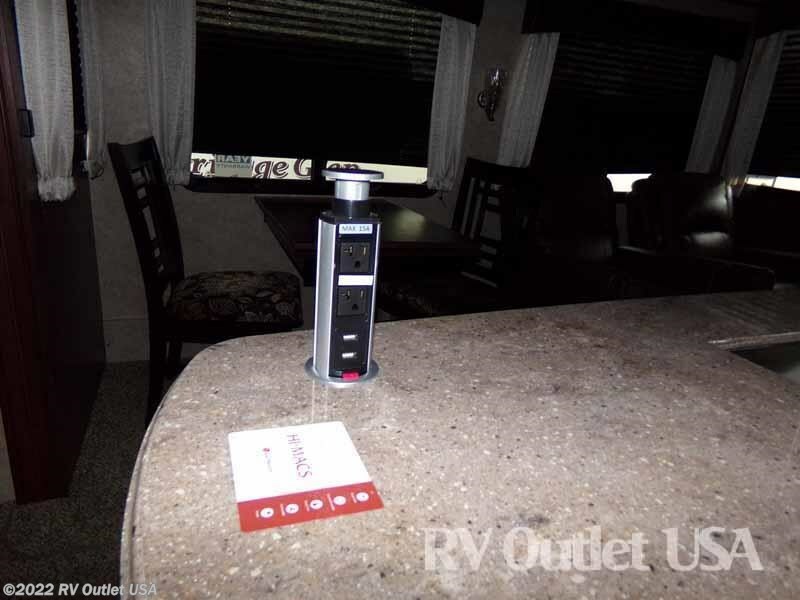 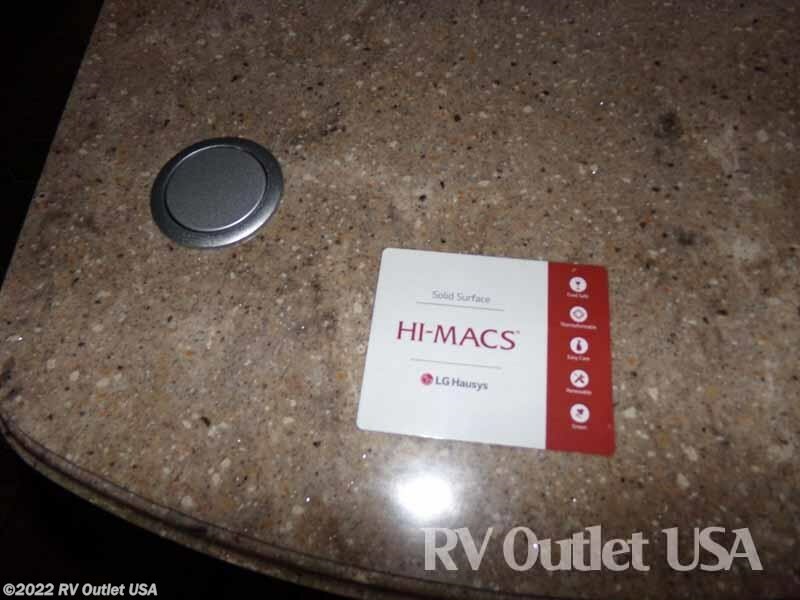 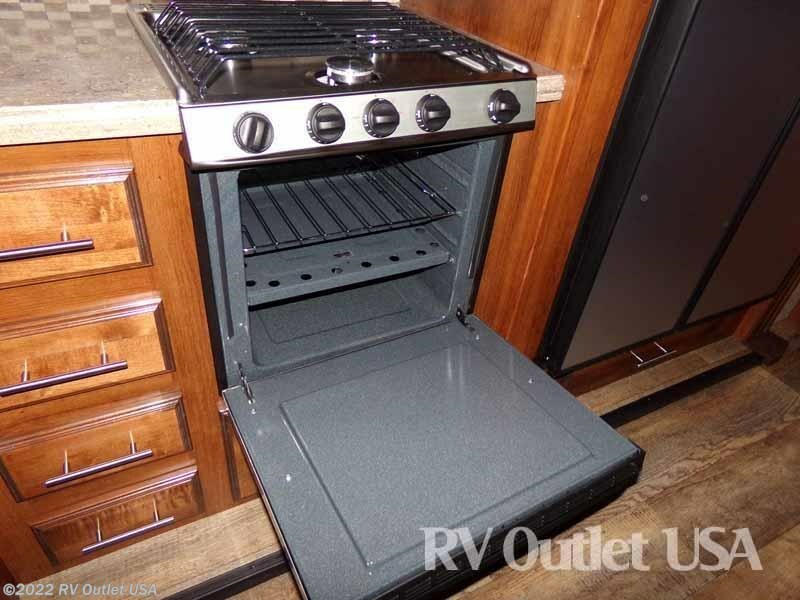 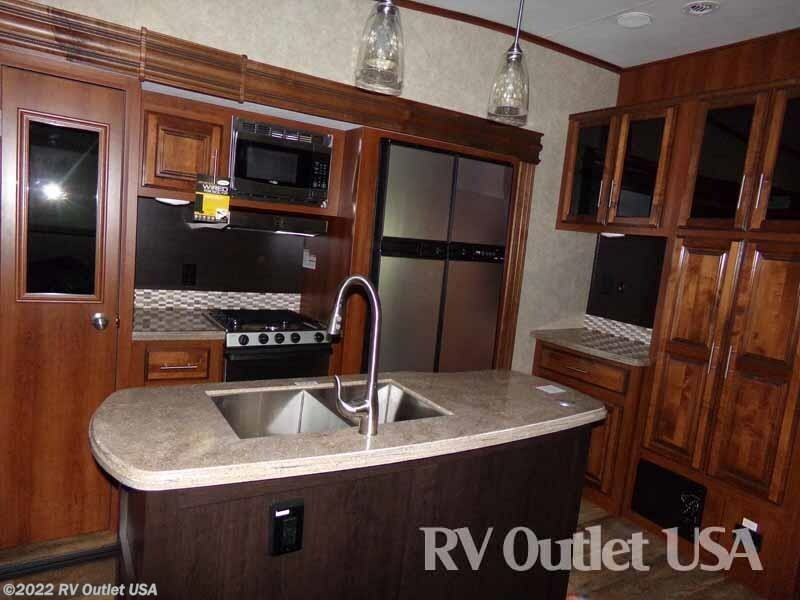 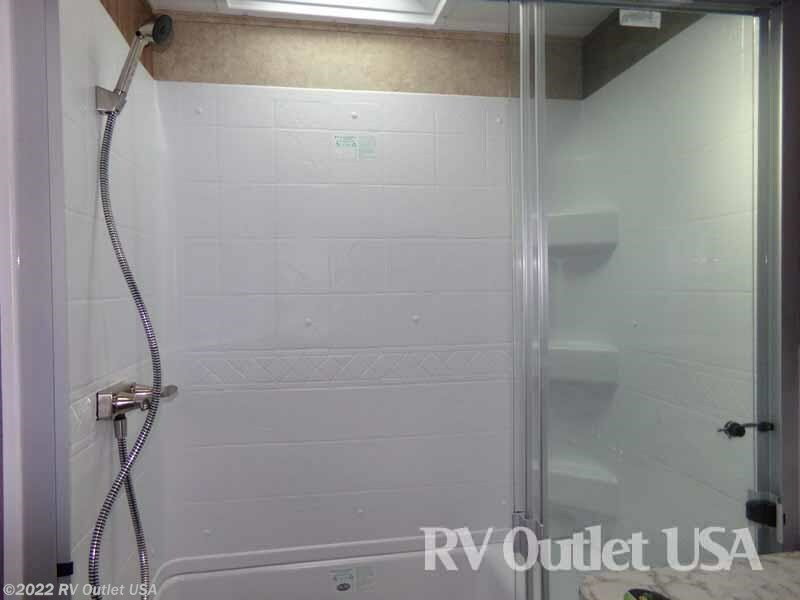 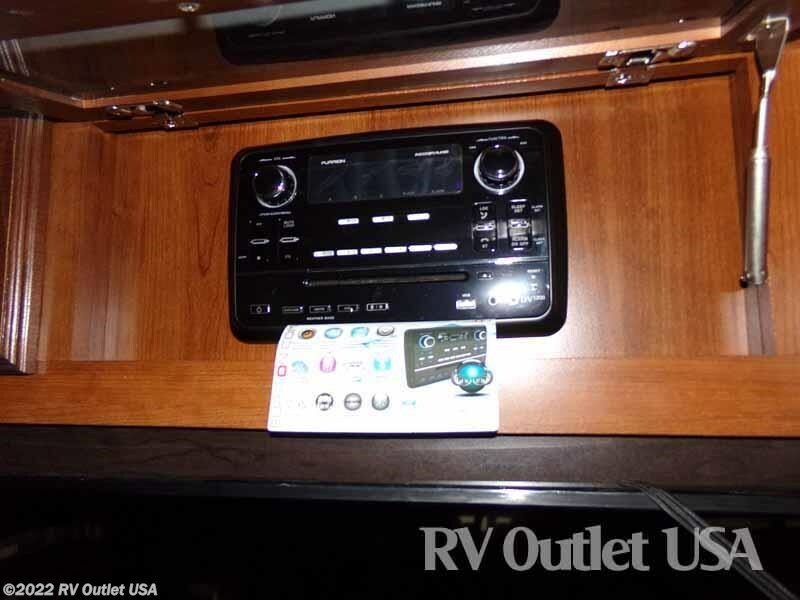 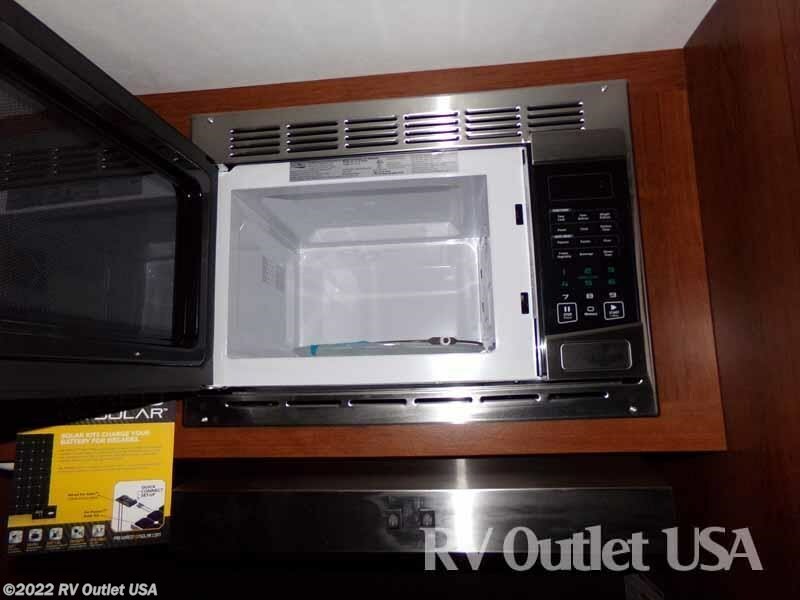 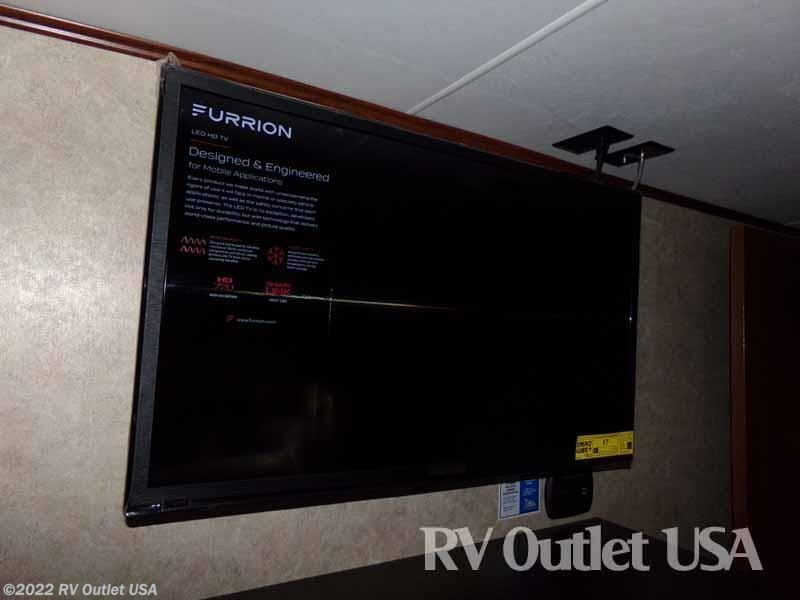 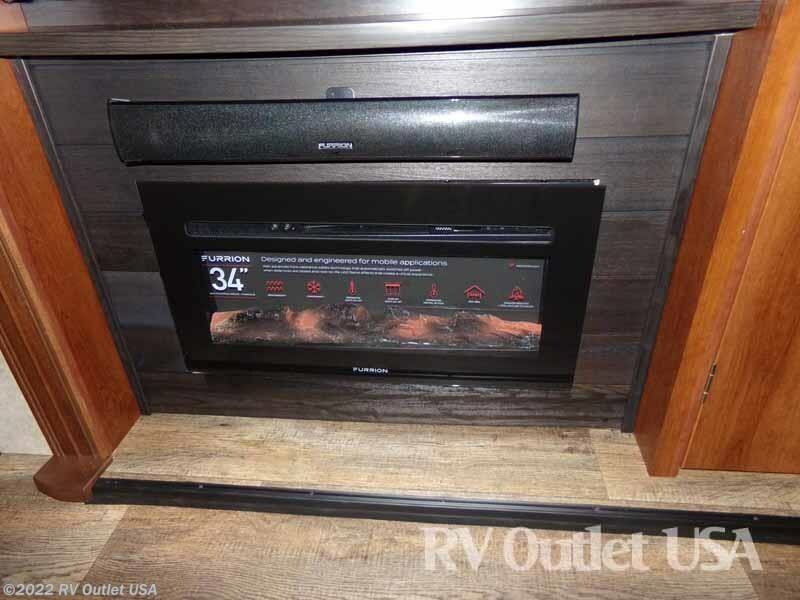 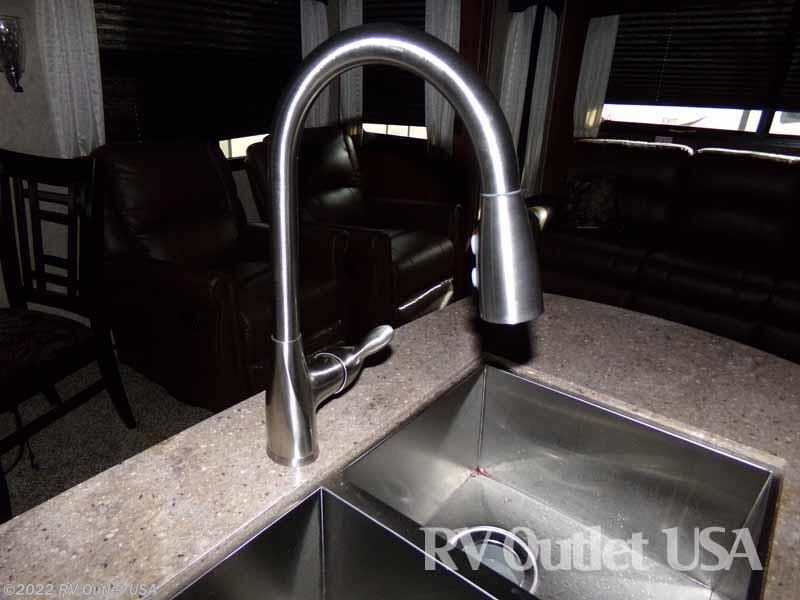 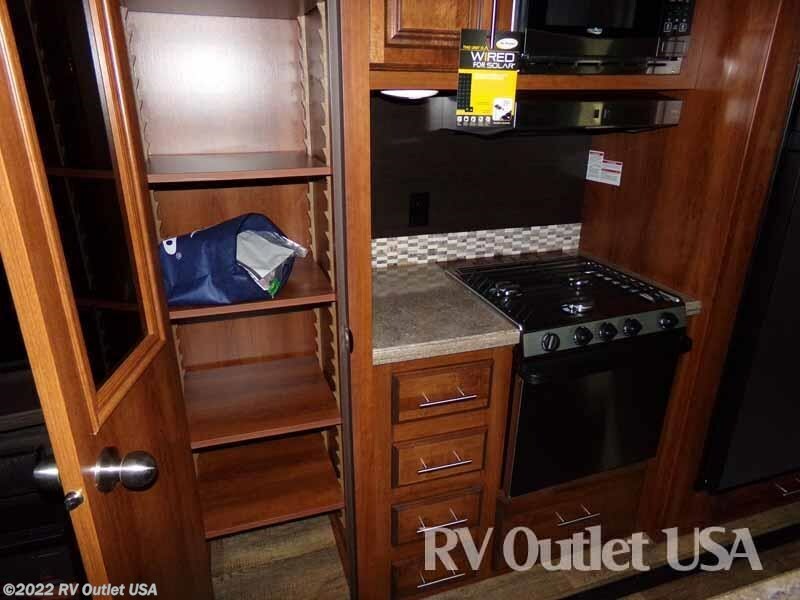 Here's a list of options that were ordered on this 2018 Jayco Eagle 321RSTS. 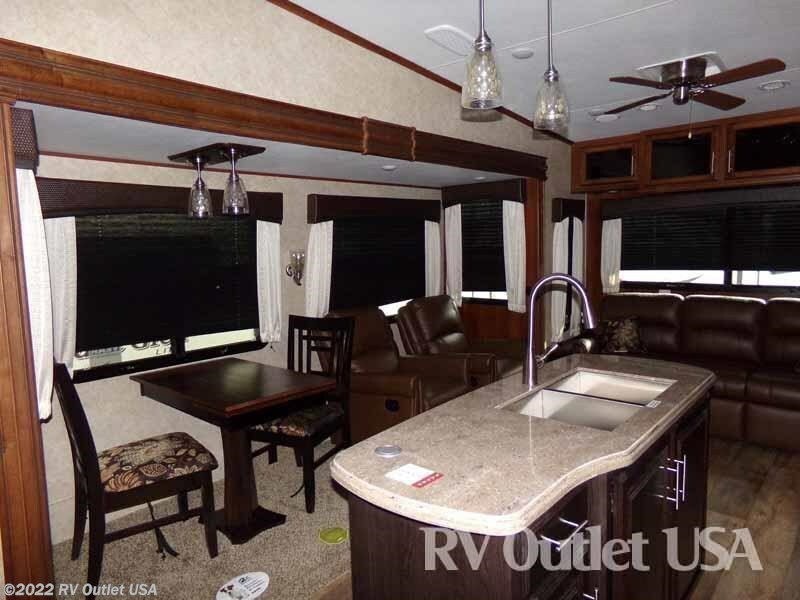 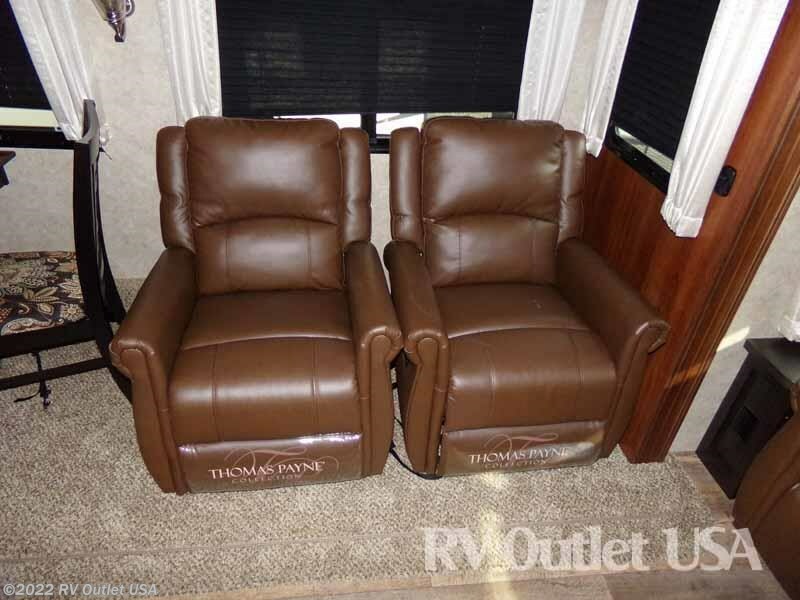 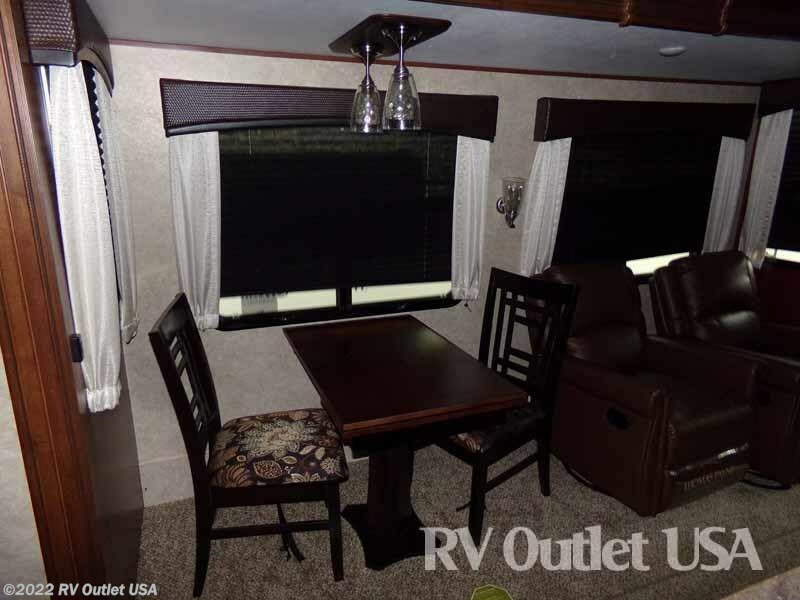 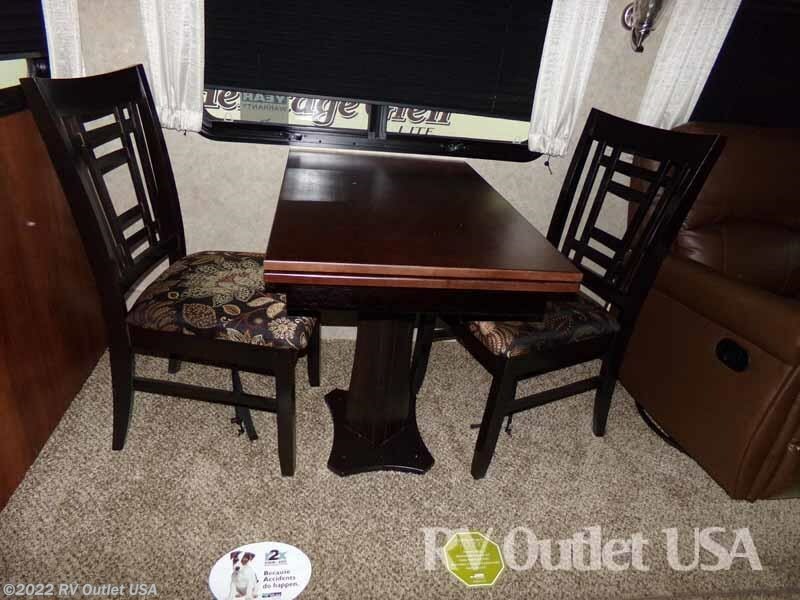 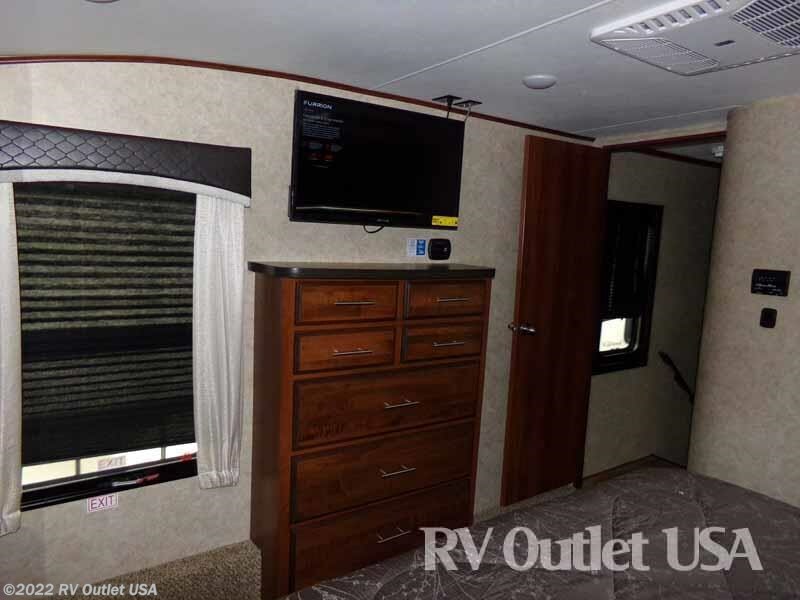 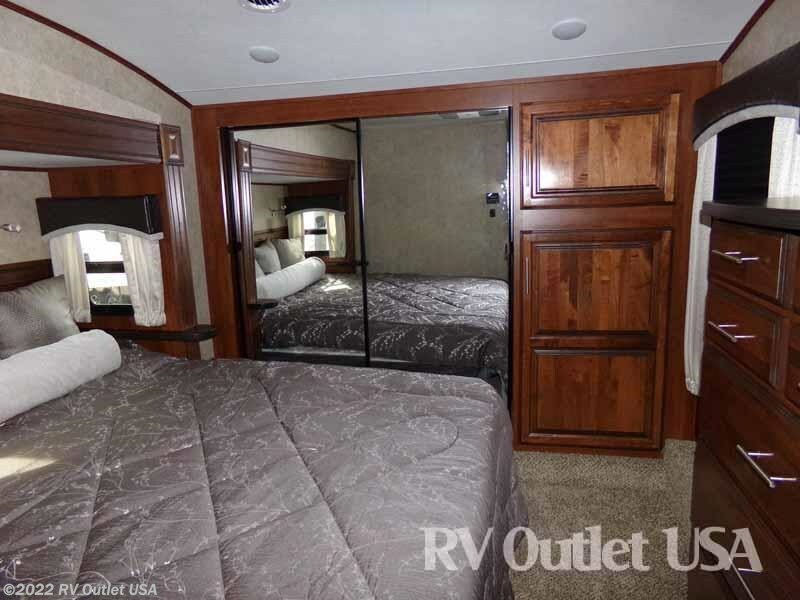 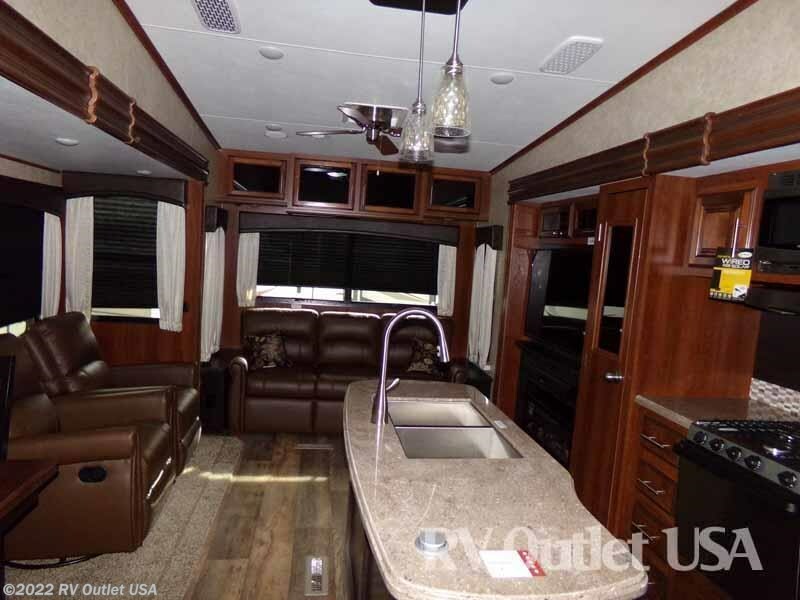 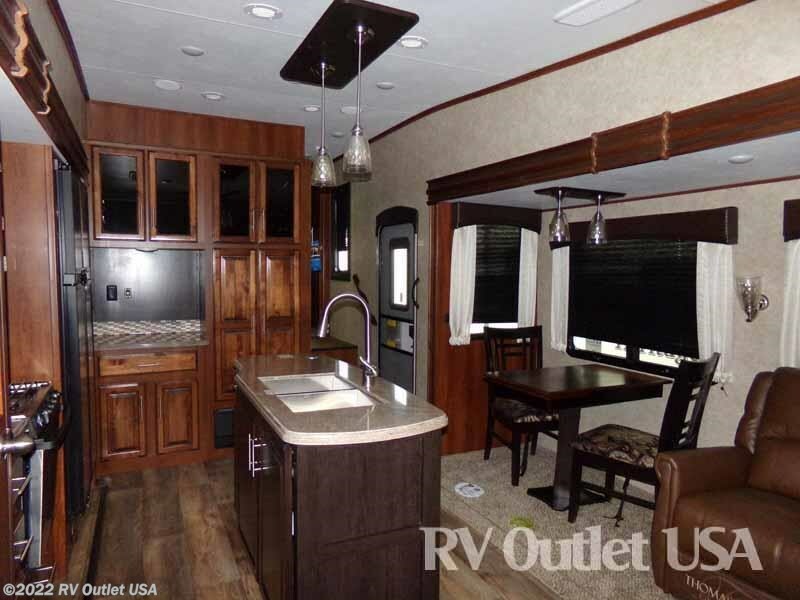 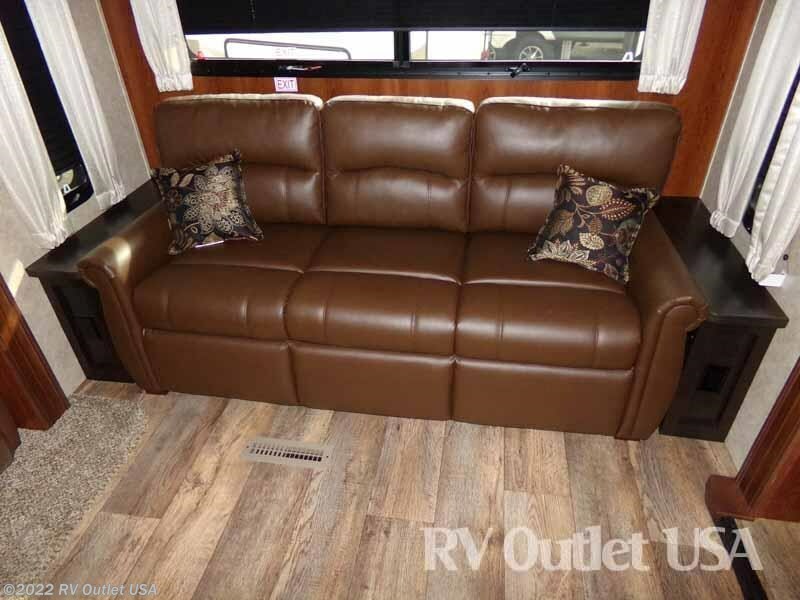 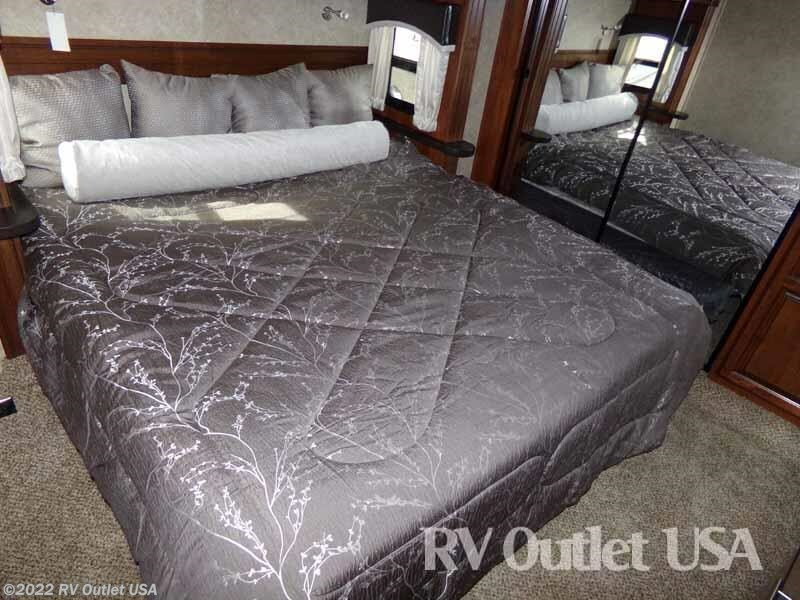 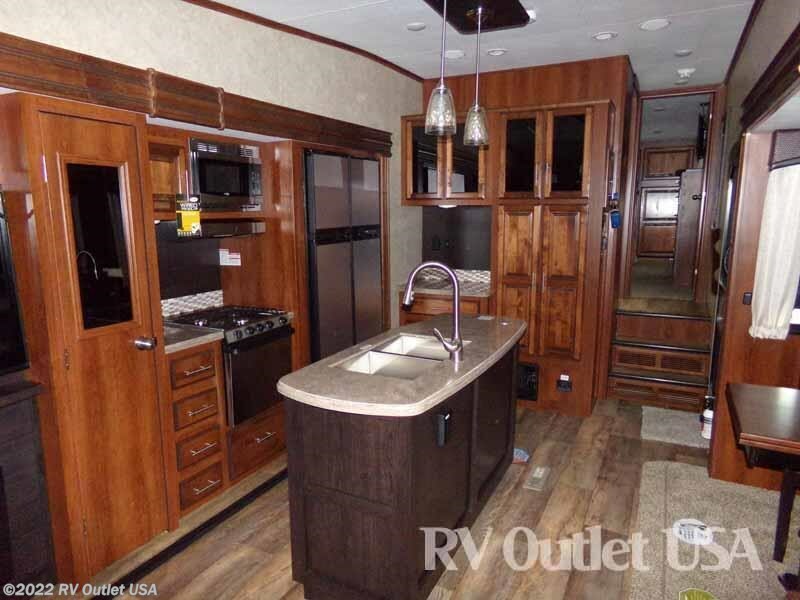 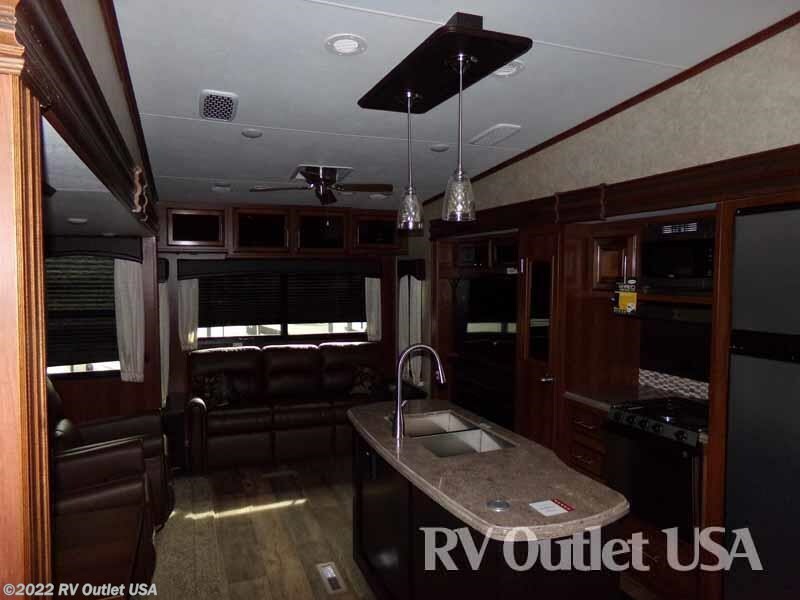 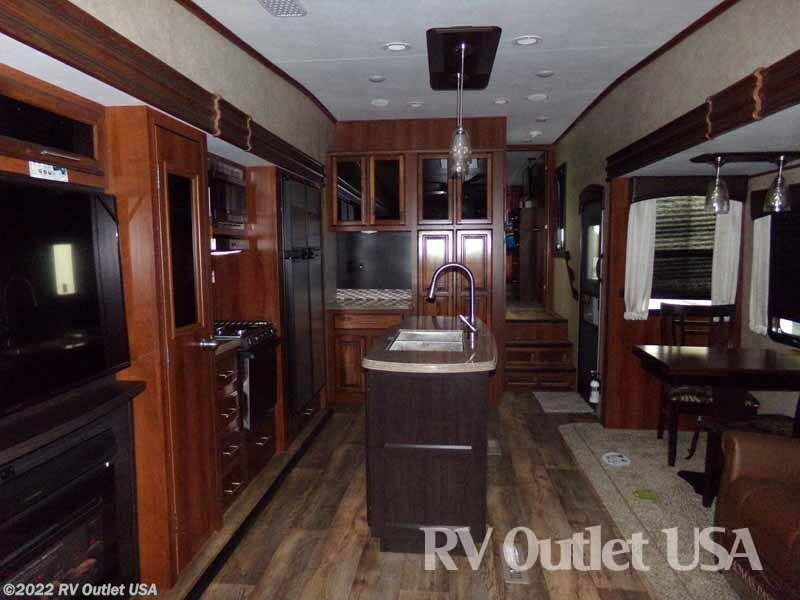 The interior color is Peppercorn, it has the CVP (customer value package), the Luxury package, the dual A/C package with (2) 15K BTU ducted A/Cs, the Mor Ryde rubber pin box, 16" Goodyear tire upgrade, the Thomas Payne rocker recliners, a King size bed, the 12 cu ft refrigerator, a 32" TV in the master bedroom and the four-point auto leveling system.